The Missionary Benedictine Sisters are proud to be participating in the Norfolk Area Big Give - a 24 hour charitable challenge organized by the Philanthropy Council of Northeast Nebraska. The giving holiday will take place May 24th from midnight to midnight. Mark your Calendars because we will need your help! Norfolk Area Big Give is a 24-hour period of giving where Norfolk area supporters are invited to give back to their favorite local charities and educate themselves on other non-profits in our community. The goal of this community-wide giving event is to match Norfolk area supporters' passions and generosity with local nonprofit organizations already doing great work. Though community members are aware of the efforts of several non-profits in the area, there is much work that goes unnoticed. Through the combined participation of all Philanthropy Council collaborative partners, it is our goal to further educate community members on the robust non-profit sector we have here in the Norfolk area and give them an opportunity to make a significant impact on the future of our beloved community. 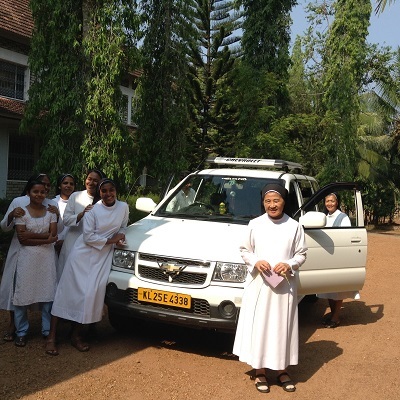 The Missionary Benedictine Sisters Project is a Minivan for the Sisters in India! Our Missionary Benedictine Sisters in India are in dire need of a minivan so that they can go together for Mass and other activities. They currently have a smaller SUV that is not large enough for all of them so the younger Sisters have to go separately. They must walk for 20-30 minutes down a mountain to the bus. There is a safety issue for them walking to the bus stop and even riding on the bus. We would like to help them purchase a bigger vehicle. How Can You Help during Norfolk Area Big Give? Donate to us on May 24th! On our donation page there will be a special drop down choice under "Use my Donation for this Purpose" and it will say Norfolk Area Big Give- Minivan for the Sisters. Spread the Word! Tell your friends that you will be giving to the Missionary Benedictine Sisters during Norfolk Area Big Give on May 24th and that you need their help! Post about the Norfolk Area Big Give on Social Media! Let your friends and followers know how they can give. Cheer us on! On May 24th, watch the leaderboard on NorfolkAreBigGive.org and update our progress on social media. Save The Date! May 24th will be a great day of generosity in the Norfolk Area. Get excited and ready to share your enthusiasm for the Sisters throughout the day. Thank you for your ongoing support of the Missionary Benedictine Sisters. We can't wait to see the Norfolk Community band together to give! For more information and to see what other organizations are raising money for please go to www.NorfolkAreaBigGive.org.